Played in the band and Amen Corner and Fairweather in the sixties and seventies. Since then he has released several solo-albums and performed studio/live with artists like Eric Clapton, George Harrison, Chris Rea and more. In 1985 he joined Roger Waters touring with The Pros And Cons of Hitchhiking and later he became a member of Roger Waters Bleeding Hearts Band. He performed at the Berlin Wall concert, on Radio K.A.O.S and Amused To Death. He toured again with Waters in 1999/2000 and will also join the 2002 world tour. The result of the US tour can be heard on the live CD: In The Flesh. Andy Fairweather-Low has also performed a few times together with David Gilmour. Marck Fenwick, MFM Ltd. has been the manager of Roger Waters since 1990. 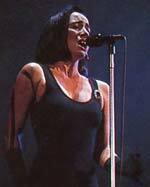 Rachel Fury performed live (backing vocals) with Pink Floyd in the late 80's. You can listen to Rachel Fury on the live album Delicate Sound Of Thunder. You can watch her on the live videos Delicate Sound Of Thunder and the TV-transmission Pink Floyd Live in Venice.